The tricky thing about reviewing a show like Supergirl in its third season is that it can be hard to come up with new things to say about episodes that are fun but lacking in depth. To be completely honest, some weeks it feels like there’s not much to do beyond recap plot details and comment on the performances. Thankfully, “Shelter From The Storm” is not such an episode. I came away from this one absolutely brimming with stuff to talk about. Though it suffers from some of the mid-season reworking issues that plagued the previous episode, for the most part “Shelter From The Storm” weaves together a whole bunch of this season’s ongoing storylines in a purposeful, engaging way. And it introduces some fascinating wrinkles to its character dynamics too. The most intriguing part of this episode is the Kara/Lena dynamic. Though Kara’s harsh anti-Kryptonite stance still feels like it’s come out of nowhere (remember when she and Alex used low levels of Kryptonite to help them train? ), the episode at least has Lena directly call out Supergirl’s god complex. After all, humans are constantly surrounded by things that can kill them yet still manage to carry on their daily lives. Why does Supergirl get to be so self-righteous about her one and only weakness? Especially when that weakness could be invaluable to stopping Reign. “Shelter From The Storm” might as well be titled “Lena Was Right About Everything.” She was right to create Kryptonite to take down Reign. She was right that telling Alex about Ruby’s location would only put Ruby in harm’s way. And she was right to spend so much time studying Sam in a secret lab—after all, that’s where the DEO takes Reign after they manage to subdue her. Even better, Lena gets to prove her faultlessness directly (although unknowingly) to Supergirl’s face in that great elevator scene. One of my biggest frustrations with the CW era of Supergirl is how much it’s downplayed the idea of Kara leading a double life, which has always been one of my favorite aspects of the Supes mythos. If you’re willing to suspend your disbelief about Lena’s inability to tell that Supergirl and Kara are the same person, that elevator scene demonstrates the storytelling potential of the secret identity concept. Kara spends the episode arrogantly assuming that the trust issues in the Supergirl/Lena dynamic are a one-way street. Kara is so concerned about whether she can trust Lena, she doesn’t ever stop to think about whether Lena feels she can trust her. In the elevator scene, Lena gets to openly acknowledge how manipulative it was for Supergirl to send James to spy on her. And Kara can’t argue back because she’s literally in the middle of perpetuating a huge lie towards her supposed best friend. In other words, Kara fucked up and she knows it, which is a far more interesting idea than her single-minded hatred of Kryptonite. 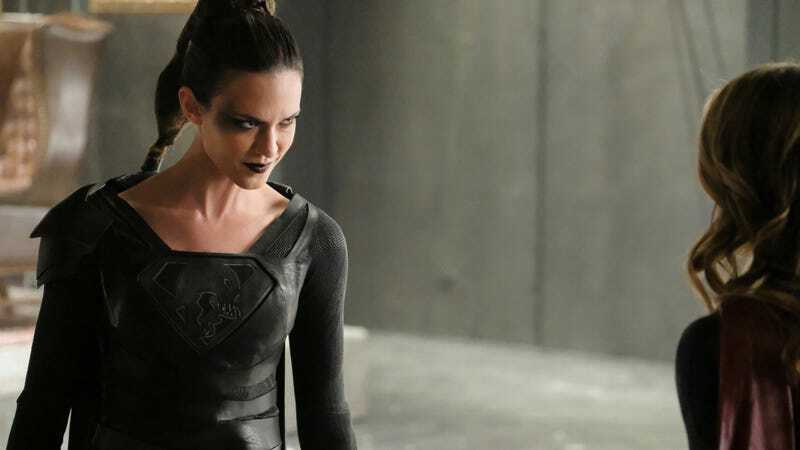 Less engaging is the way the episode clumsy maneuvers itself so that Mon-El can return to Earth even as Brainy and Imra journey “back to the future.” It’s equal parts predictable and inelegant, with Imra channeling Bill Pullman in Sleepless In Seattle as she magnanimously encourages her partner to follow his heart. At this point, I’d prefer it if Supergirl just had Kara and Mon-El immediately get back together rather than stretching out their painfully inevitable romantic reunion any longer. The main thrust of the episode, however, is about Reign, and “Shelter From The Storm” starts to provide payoff for how much time the first half of the season took to establish Sam and her backstory. Betty Buckley returns as Sam’s estranged mother Patricia and provides the episode with a much-needed emotional human element. From the beginning, Supergirl has loved a complicated mother/daughter dynamic and this episode takes full advantage of that. Realizing just how badly she failed as a mother, Patricia makes one final attempt to appeal to her possessed daughter—not for Patricia’s sake but for Ruby’s. Yet she still winds up dead for her efforts. It’s a dark moment and one that allows Melissa Benoist to put her empathetic crying skills to good use. Across the board, it’s in its willingness to go dark that “Shelter From The Storm” succeeds. Ruby survives Reign’s attack, but Patrica is killed; Kara and Lena’s tension is left unresolved; and M’yrnn’s heartbreaking memory issues remain even after he helps Supergirl figure out a way to appeal to Reign’s sense of justice. “Shelter From The Storm” resists the urge to tie everything up in a neat bow or even to give any real indication of where the season goes from here. With Reign at least temporarily captured, it’s anyone’s guess as to how the final five episodes of the season will play out. I’d love to read an oral history about the way this season changed during production. The idea that Brainy, Imra, and Mon-El didn’t wake up the other Legionnaires because they were infected with the Blight really feels like a retcon. Equally inelegant is Brainy’s quick explanation that there’s absolutely no way that Reign evolves into Blight even though she absorbed Pestilence’s powers. There are a lot of really cool action concepts in “Shelter From The Storm,” especially in the final fight in Lex’s booby trapped mansion. It’s just a shame that the episode doesn’t quite have the CGI budget to pull them off. I love that Brainy’s seemingly kind gesture of giving Winn a jar of 31st century dirt was actually just a way to bug the DEO. Kara and J’onn get a couple lovely scenes together in this episode. More of that please! The episode ends with a mysterious scene of a young woman stealing a book that belongs to Thomas Coville’s Cult of Rao.